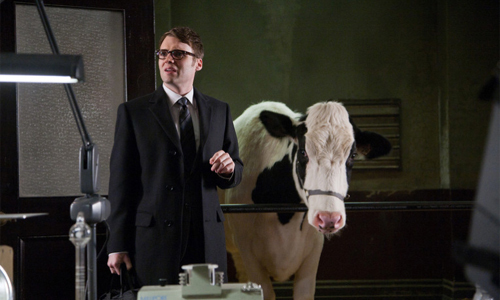 Cultural Wormhole: Fringe - "Stowaway"
Lincoln Lee (Seth Gabel) of the Fringe Prime universe makes his television debut. Oh, 'Fringe'! So cute and clever with its multi-leveled episode titles. See "Stowaway" refers to William Bell sneaking into Olivia Dunham's mind as well as poor Dana Gray, who can't die, but is trying to hitch a ride to the afterlife with the souls of suicide victims. What? You already figured that one out? Oh, nevermind. While I commend Anna Torv for going for it in an attempt to channel Leonard Nimoy, I think she fell a little short here. She's done an amazing job this season delivering on the nuances of differences between Olivia and Fauxlivia, but her Willivia was more "old man" and less "Spock". I said last week that for this to really work, the creators had to really play up the absurdity of the situation. They didn't quite "Brown Betty" it, but I think they could have taken it a bit further. Still, there were some great moments, especially Bell's flirtations with a mindblown Astrid (possibly made more interesting subtextually if Astrid is gay like Jasika Nicole), and some solid character moments between William and Walter (particularly in their discussions while brushing Gene the Cow. While the Willivia subplot took Olivia off the board as a FBI field agent, this did provide the perfect opportunity to introduce the Fringe Prime version of Lincoln Lee. One could argue that Broyle could have filled this role for the hour, but he's the boss, not an investigator. There don't seem to be that much difference between the two Lincoln personalities. This one wears glasses suggesting he may be slightly more bookish, but Alt-Fringe Lincoln is pretty brainy himself. This Lincoln really worked well with Peter. It would be a hoot if this Lincoln had the hots for Peter, while his counterpart had it for Fauxlivia. What a strange and twisty love mobius that would be. It was great to see Paula Malcomson so soon after the cancellation of her own sci-fi series "Caprica". I couldn't help but chuckle at some of the similarities between her character here and on the other program. On 'Caprica' Malcomson plays Amanda Graystone, while on 'Fringe' she was Dana Gray. On 'Caprica' Amanda tried to kill herself by jumping off a bridge. Dana tried to hitch a ride on more than one occasion with someone that committed suicide by jumping out a window. I think that Malcomson did a great job considering that she never had any scenes with the regular characters on the show. She's a strong and emotive actor, that can deliver a ton even without having another person to work with. I was partially hoping that Dana was another Cortexiphan kid so they could keep Malcomson around, but she's probably just a hair too old. "Stowaway" continues to fit the model of the types of episodes 'Fringe' is producing since the move to Friday. The standard Monster of the Week cases continue to dressed up with a welcomed helping of big picture progression and character development. Far from the best of season three, but considerably better than a large chunk of season two.